On September 9, Tim Cook unveiled the Apple Watch, “the most personal product” Apple has ever made, says the company, “because it’s the first one designed to be worn.” The watch joins other products like bracelets from Fitbit and Jawbone in a category called “wearable technologies,” or wearables. Beyond decorating your wrist, these products are primarily worn to send, receive, and process information, through cellular networks, WiFi, Bluetooth, or—unique to Apple’s Watch—near-field communications (NFC). The Apple Watch can monitor your heart rate, track your location (through an accelerometer, gyroscope, and GPS), and recognize your voice. Smartphones and their apps have already been doing great things for users managing their energy (and much more, including fitness), for example through connected thermostats, electric vehicle charging, solar panel output monitoring, sharing-economy services, and much more. So why would you wear Apple’s Watch when you have an iPhone? What extra value do wearables unlock that already isn’t accessible through other technologies? First, wearable technologies can collect biological data, such as your heart rate and body temperature—that a phone in your pocket cannot. These data sources can tell a more complete story about your physical state than data from your phone. Second, wearable technologies are less likely to be separated from the user. Unlike phones, most users will wear their Apple Watch in the shower or in bed. In other words, it’s always with you. This connectedness between wearable tech and the wearer opens up at least three categories of energy management opportunities: at home, at the office, and personal. Wearable tech can help better match our homes’ energy use—especially heating and cooling—to our needs. For example, Nest’s Learning Thermostat has a built-in motion sensor. It’ll put your home’s HVAC system into an energy-saving “away” mode after a period of inactivity. But imagine how much energy could be saved if a device on your wrist signals your thermostat to go into “away” mode the moment you leave your home or neighborhood. Similarly, programmable thermostats can be set to pre-condition your house so that it’s a comfortable temperature when you wake up and roll out of bed in the morning. Some smart thermostats even detect when you typically wake up during the week and create a fixed start-up time for your thermostat based on that. But wearing a device on your wrist—which is either connected to an alarm to wake you up, or which detects your sleep cycles and learns when you’re likely to wake—can more accurately tailor your home’s pre-conditioning to match your actual wake-up time, rather than a weekday thermostat program set to the same time, on average, you’re likely to get up. Have you experienced working in a ridiculously frigid office in summer, because the building control system does not know how people feel? Or an overly hot office in the winter? Even an office that’s conditioned well to a target temperature could feel too hot and/or too cold (even at the same time!) given one person’s preferences vs. another. Wearable technology can provide information like body temperature, heart rate, and respiration, giving a more complete picture of physical comfort. Voice recognition software could even detect when people are complaining about feeling too hot or cold. Even more, wearable tech and other more personalized devices can help to condition the person, rather than the entire space—in fact, that’s the very principle behind heated seats and a heated steering wheel in the Nissan LEAF; it’s more efficient to make the person feel comfortable, rather than heat or cool the entire cabin. In an office setting, think of office chairs with heating elements, wristbands that cool your wrist like that from Wristify, or vents that determine personal air flow like those from Ecovent. Beyond the office, wearable tech can have other applications when out and about, too. At the product launch, Cook described how the Apple Watch can replace a hotel keycard to unlock your room as you approach the door. Similarly, your watch can connect to your hotel room’s thermostat, to delay room cooling until you have checked in. No energy is wasted cooling an empty room, while ensuring a guest’s room is comfortable as they enter. A COMING ERA OF PERSONAL ENERGY PROFILES? In a coming era when energy use becomes not just highly personalized, but attached in fact to individual people, it’s not hard to imagine developing personal energy profiles of our individual demand and consumption. And that could open the door to personal energy bills. Usually we bill our energy use to our energy-consuming assets—electricity and natural gas billed monthly for our home, for example. But imagine if instead of assigning energy consumption to our assets we re-assigned that energy consumption to ourselves? Gone could be the arguments between roommates about how to equitably split the utility bill (one of the top sources of friction among roommates in places such as New York City). Or what if wearable tech, in addition to sending personal information out to the systems around us, could also receive signals back to us, such as from your utility. Could wearable tech further open the door to a personal version of demand response? For example, similar to how utilities use demand response to cycle off air conditioners during times of exceptionally high peak demand in summer, could they instead signal a Wristify bracelet to cool a person instead of an AC unit cooling a whole house, or could your Apple Watch receive a signal from the utility asking you to have an ice-cold tea instead of turning up the AC at 4:00 p.m.? Many of the comfort-improving, energy-saving features above are enabled by more information about you being shared with computers. This of course opens up another set of issues around Big Brother watching and the privacy of potentially very personal information, who can “see” that information, and how will they be allowed to use that info. Whether having the option to turn such data sharing on or off, or another solution such as anonymizing the data, the face remains that wearable tech could be another front line in the grid’s evolution toward more distributed energy resources. Those DERs could now include not just things like rooftop solar panels and batteries in your garage, but also wearable technologies and the people who wear them. This blog was originally posted on RMI’s blog. In 1982, Buckminster Fuller led a workshop exploring geodesics and other topics. 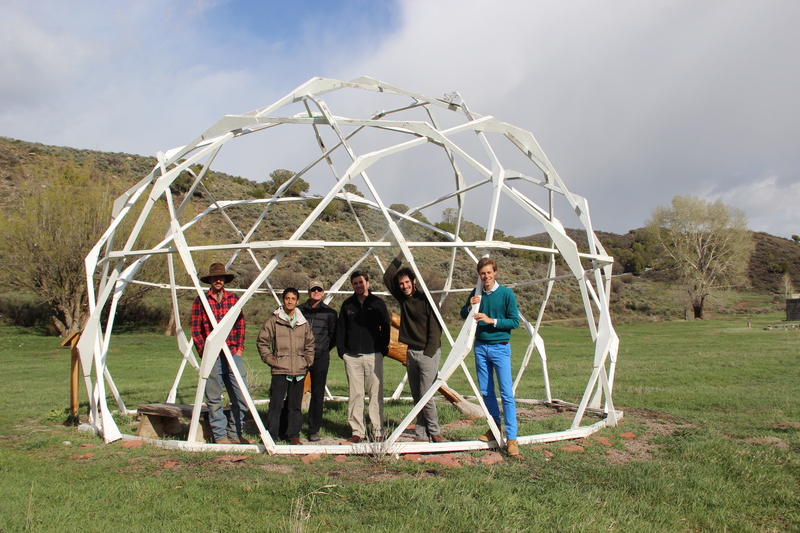 From that workshop, the idea arose to build a biodome on John Denver’s Windstar estate in Old Snowmass, Colorado. In the summer of 1983, weeks before construction was scheduled to start, Bucky died of a heart-attack. In his spirit, a group of young architects and engineers including Bill Browning and John Katzenberger built the Windstar biodome. The goal of the biodome project was to produce food locally year-round in a cold climate with solar energy. The dome was glazed with two layers of plastic film separated by an air space. Until the late eighties, the biodome was used to grow a variety of vegetables and fruit. The dome was separated into two levels, the lower level including a pond in which fish were raised, which doubled as a heat storage medium. An army of volunteers was involved to maintain the indoor (and outdoor) gardens. Today, only a structure and many stories are left. When I arrived at Windstar three months ago and saw the dome, I knew immediately that I wanted to restore this legendary structure. 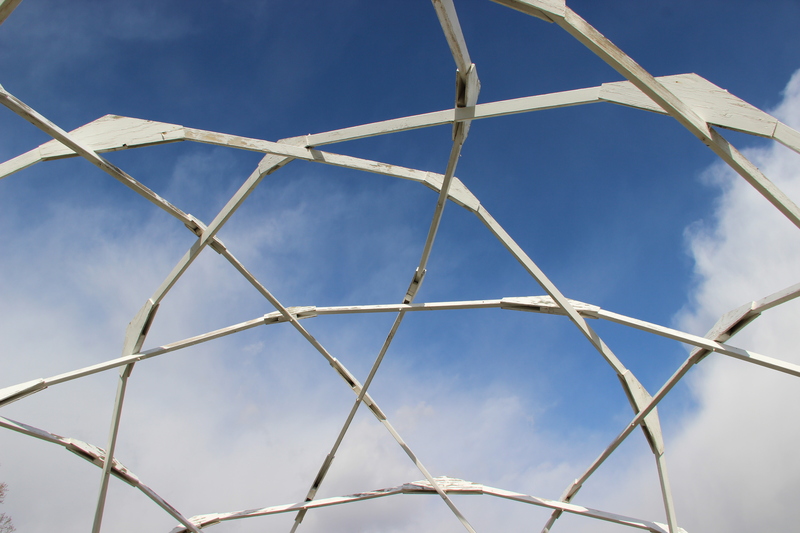 Imagine re-building the last dome Buckminster Fuller designed! I soon learnt that I was not the only person excited about this prospect. Eden Vardy, founder of Aspen Tree, an NGO that aims to connect people to nature through agricultural training, had a similar idea. 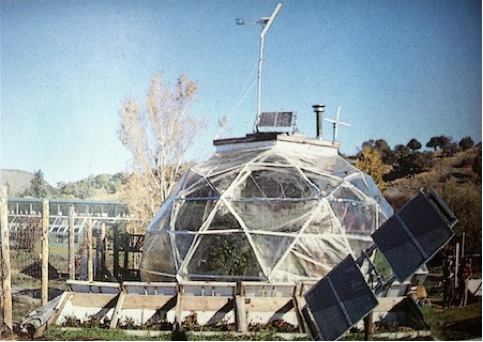 In fact, Eden and Aspen Tree’s co-director Paul, had erected another biodome close to Aspen in the fall of 2013. After Amory introduced us, it was evident we had to team up. How to make this idea work? The first step was to develop design alternatives. Eden and I convened eight people—Greg Rucks, Dan Wetzel, Robert McIntosh, Garrett Fitzgerald and myself (all from Rocky Mountain Institute), Eden Vardy and Paul Huttenhower (both from Aspen Tree), and Michael Thompson, an architect with experience in designing grow houses—to participate a design charrette, a process to develop design alternatives. The first goal of the charrette was to brainstorm design alternatives to glaze or skin the dome. We started the process outside, gathering all participants under the 5m-diameter dome (picture at top of this post), to be inspired by the dome’s history and understand the technical details of the current structure. 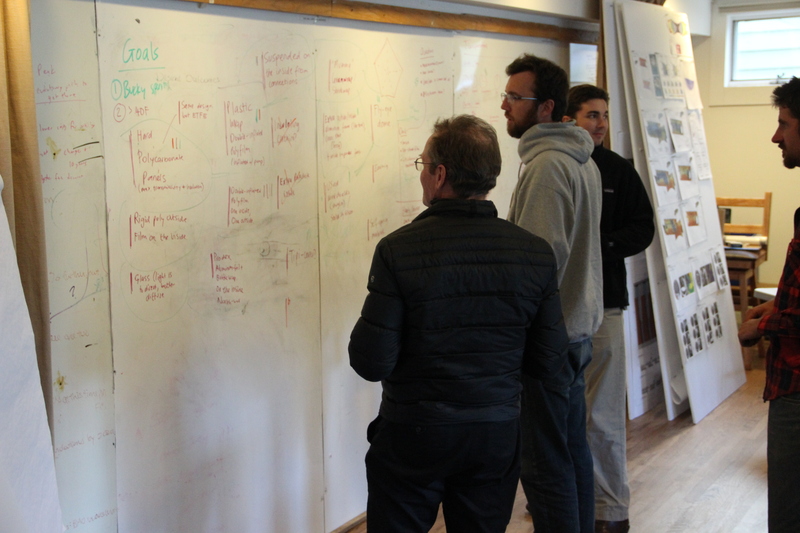 After sharing stories about the biodome’s original state, we moved inside to start the charrette. 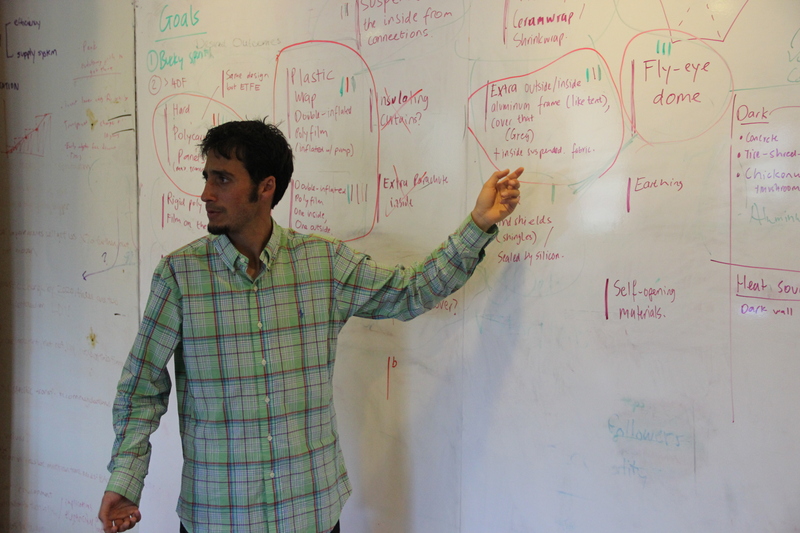 In the next hour, we generated many interesting ideas—building an opaque dome to use for mushroom-growth; using old parachutes as inside insulation; and building a fly-eye dome—and consequently selected four ideas to further develop. The group split into four pairs, each pair given the task to develop a list of materials and next steps per design alternative. 1. Hard polycarbonate dome. The current structure is a “basket weave”-dome. As in a woven basket, the ribs alternatively pass concentric or eccentric of one another. This means there is no flat plane to which to adjust all three sides of a triangle or five sides of a pentagon. 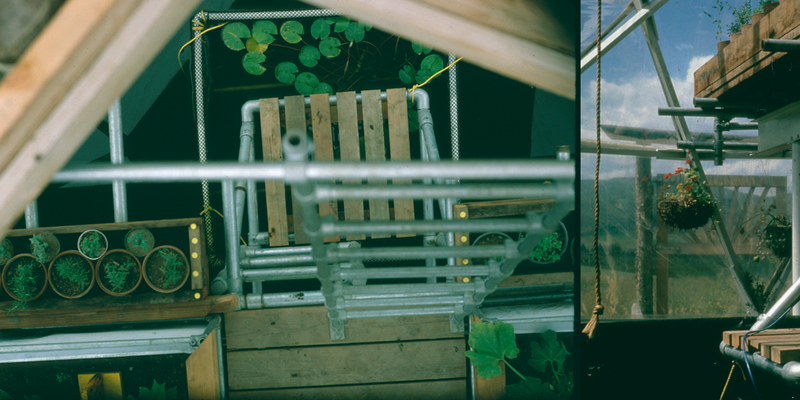 Paul suggested a way to fix this by adding plywood to the joints, but the group questioned whether that was in line with Buckminster Fuller’s idea of ephemerilization—doing ever more with fewer pounds of material. Michael estimated that the material costs for the polycarbonate were ~$4,200 for a ~1200 square feet surface area (at $3.50/square foot), or double that if the parts were to be ordered pre-cut. 2. Double-inflated polyfilm dome. This was the design of the original dome (second picture in this post). In 1983, the intention was to perfectly seal the space between the plastic films and fill the space with a gas with a low heat transfer coefficient. The inserted gas between the films quickly leaked out, so an airpump was installed to inflate the “pillows”. The benefit of this idea would be that few to no more material needs to be added to the structure of the dome. Michael estimated that the material cost for the double-inflated polyfilm would be $1,000 for the dome (at $0.75/square foot). 3. Extra external or internal structure. Greg and Robbie worked on the idea of adding an additional light structure around the outside of the dome, inspired by aluminum tent-poles, over which a permanent or temporary insulating material could be draped. The idea arose of a slinky-type external cover, made of aluminum or carbon fibre ribs and an insulating fabric, that can be pulled across the dome during the night. Michael suggested that an internal additional structure could be a better idea, given high snow loads in Aspen. 4. Fly-eye dome. Dan and Paul explored the idea of creating a fly-eye dome. This type of design would need much material compared to the three designs discussed above. Garrett accordingly asked what the primary goal of the fly-eye dome would be, to which the group agreed that the function was mostly aesthetical. Michael, Greg, and Robbie voting for ideas. Reflecting on the charrette, it is most likely we will implement the double-inflated polyfilm dome, possibly with an additional internal structure as developed by Robbie and Greg. The benefits of this design are low material costs, identical appearance as the original, and quick installation. The next critical steps for the projects are to raise funding for construction materials and to apply for a building permit. If you are interested to help during construction of the dome, please comment on this post. Structure of the dome. Note the “basket weave” of the ribs—each rib alternates between passing concentrically or eccentrically by other ribs.